WASHINGTON — Northern Virginians have some of the shortest-distance commutes in the state — but they have the longest commutes in terms of time. Average daily trip lengths in Northern Virginia measure under 10 miles, but average commute times clock in at over 30 minutes. Meanwhile, in Harrisonburg, where average trips are around 11 miles long, commutes average less than 10 minutes. Regular traffic jams and unpredictable travel times are two leading issues that can force Northern Virginia commuters to set their alarms an hour earlier than they might have to for a similar commute in another part of the state. According to baseline data collected as part of Virginia’s long-range transportation planning process, Northern Virginia drivers in 2014 had to allot about 51 minutes for what would usually be a 30-minute congested trip on a highway just to avoid being late. On non-interstate roads in Northern Virginia, drivers had to allot about 8 extra minutes for a 30-minute trip, which is comparable to what drivers in other parts of the state had to allot for interstate travel. 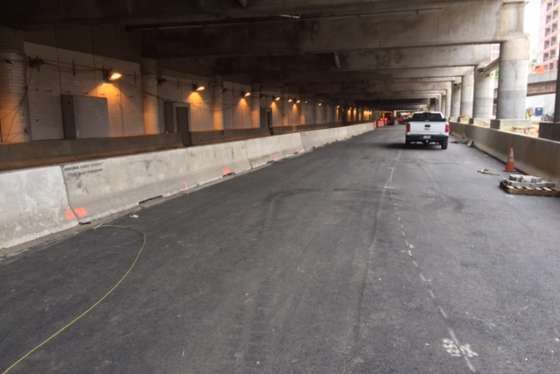 The $1.4 billion Capitol Crossing project being built over the 3rd Street Tunnel/I-395 in Northwest D.C. has reached a milestone: A new ramp to access the highway is opening Saturday. That extra travel time is in addition to expected delays in areas where there always seems to be a traffic jam. “We mean, ‘Even if the road is congested, if it takes you 45 minutes on Monday, will it take you 45 minutes most Mondays,’” Virginia Deputy Transportation Secretary Nick Donohue said of the measure. Northern Virginia faces many times more congestion than any other part of the state as measured by the number of people who sit in traffic for the most miles. While statewide 2014 data showed that 2.4 percent of interstate miles traveled at the peak hour are congested, that number is 18.5 percent in Northern Virginia. Non-interstate roads have similar disparities, with 1.5 percent of peak-hour miles traveled statewide by people stuck in traffic. But in Northern Virginia, 7 percent of those non-interstate miles traveled are congested. The state is working on ways to measure progress long-term and come up with ideas to reduce the amount of travel in the worst traffic, speed up commutes, cut down on freight bottlenecks, improve reliability and improve safety, among other things. “The really hard part is figuring out where do we want to be in the future with the resources and policies that we have available to implement … and really how do we then want to track progress,” Donohue said. Donohue plans to present trends in the data next month to the Commonwealth Transportation Board.